The Whiskered bat is small (wingspan of 190 - 225 mm), with very dark, frizzy fur and a very lively behaviour. It is distributed in a wide number of habitats (urban, mountainous and agricultural areas, as well as forests) and during summer M. mystacinus roosts in crevices in rocks, buildings and tree holes. For hibernation, the species prefers underground sites. M. mystacinus hunts along vegetation edges, open fields and over water; its diet is quite broad and includes Diptera, Arachnida and Lepidoptera. 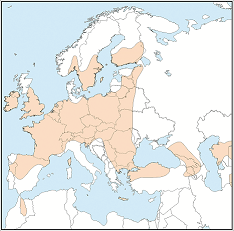 The Whiskered bat occurs in western and central Europe, as well as southern parts of Scandinavia and the British Isles. It has also been confirmed in the Caucasus and in Morocco. Can often be confused with M. aurascens. Threats include loss of woodland and damage to roost sites in trees, buildings and underground habitats.